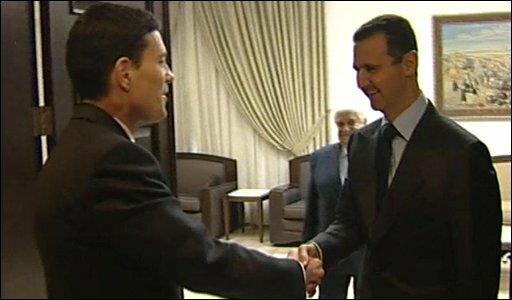 UK Foreign Secretary David Miliband has held what he said were positive and constructive talks with Syrian President Bashar al-Assad. Mr Miliband, the most senior British politician to go to Damascus for seven years, said Syria had a key role in encouraging stability in the region. But a BBC correspondent said each side's statements do highlight clear divisions over Syria's key ally Iran. Mr Miliband will later go on to Lebanon as part of his Mid-East tour. He has already seen Israeli and Palestinian leaders during the first leg in Israel and the West Bank. The BBC's Wyre Davies in Damascus said few concrete details emerged from the talks, which overran their schedule of one hour by 45 minutes. Afterwards Mr Miliband held a joint press conference, with his Syrian counterpart, Walid Muallim, who visited London in September. Mr Muallim said his country could be a positive link between the west and Tehran - which is accused by some western powers off seeking a nuclear arms capability. Mr Miliband was more guarded saying that all governments with an interest in regional peace should do what they could to stop nuclear proliferation in the region. Earlier in a BBC interview, Mr Miliband said building mutual understanding between the UK and Syria was important. "Syria has a big potential role to play in stability in the Middle East - it can be a force for stability or it can be a force for instability," he said. "Over the last 18 months I've been talking with the Syrian foreign minister about her (Syria's) responsibilities in the region, in respect of terrorism, in respect of Iraq, in respect of the Middle East peace process, and we've got the chance now to take those discussions further forward." On Monday, he called on both Israelis and Palestinians to maintain the five-month-old ceasefire in Gaza, following recent outbreaks of violence.